Short on time? Download your FREE list of the BEST Force Free Dog Training Books Resource Guide here. Life is a never-ending series of opportunities to learn. We make choices and we learn from the consequences of those choices. We learn to be a better parent when our children start talking and call us out on our mistakes and hypocrisy. We grow as an entrepreneur when we step out of our comfort zone in pursuit of a dream. And we become a better dog owner when we are resourceful, open-minded, and informed. There are no mistakes in life. There are only opportunities to learn and do better next time. I spayed my first Mastiff, Maya, at 7 months old. My dogs today are left intact. I used prong and choke collars on Maya and Burton. Today, my boys wear harnesses and buckle collars. I used to feed plain, dry kibble with cheesy puffs on top. Today my boys are raw fed. Over 3 decades of owning and training large and giant breed dogs has taught me one thing – I may know a lot, but I don’t know everything. And having a dog trainer, or several dog trainers, as mentors, has changed my life immeasurably as a Big Dog Mom. The three steps you can take today to find a great dog trainer for your big dog. Big Dog Mom’s Favorite Dog Trainers – What Good Looks like! Dr. McConnell is a Certified Applied Animal Behaviorist (CAAB) Emeritus, who has made a lifelong commitment to improving the relationship between people and animals. I discovered Patricia McConnell while living in Wisconsin many years ago and listening to her on Wisconsin Public Radio’s Calling All Pets, which was heard in over 110 cities around the country. And as luck would have it, we trained our dogs, Maya and Burton, at Dog’s Best Friend Training, LLC., a dog training center that, at the time, was co-owned by Patricia McConnell. Dr. McConnell is known worldwide as an expert on canine and feline behavior and dog training and is an award winning author (Puppy Primer,The Other End of the Leash,The Cautious Canine, and many more! ), speaker, and featured canine behavior expert on countless media outlets. If I had to describe her dog training philosophy, it would be a “canine behavior first” mentality. In other words, what is the dog thinking when you say or do that? How can we as dog owners better communicate with our pets to improve our relationship with them? It was from Patricia McConnell that I learned the importance of body language and nonverbal cues in dog training. Pam Dennison is a member of the DWAA (Dog Writers Association of America) and is a Certified Dog Behavior Consultant with the IAABC (International Association of Animal Behavior Consultants), member of The Pet Professional Guild, Truly Dog Friendly and former member of NADOI and Association of Professional Dog Trainers. She founded Positive Dogs, in 1996, and since then, she has helped thousands of dogs and handlers build their relationships and solve problems, by teaching basic obedience through competition and working with a myriad of behavioral problems. Pam teaches puppy K, basic obedience through the Canine Good Citizen test, competition obedience, Rally-O and holds regular classes and seminars for aggressive dogs. I discovered Pam after my experience with Linus. Her work with aggressive dogs specifically is what drew me to her work and I have come to deeply respect and admire her as a dog trainer. As an author and speaker, Pam’s motto for Positive Dogs is “Positive Methods create Positive Results” and I couldn’t agree more. Turid Rugaas is recognized as an international expert in dog training and canine behavior. Turid is an acclaimed speaker, best selling author, and founder of the International Dog Training Education course offered worldwide. She is the leading expert on interpreting the body language, natural coping abilities, and problem-solving skills of dogs and lectures all over the world on those topics. I discovered Turid’s book,On Talking Terms with Dogs: Calming Signals, a couple years ago and have dedicated a large part of my own training in better understand and responding to the signals my dogs are giving me. Dr. Dunbar is a veterinarian, animal behaviorist, and writer. He received his veterinary degree and a Special Honors degree in Physiology & Biochemistry from the Royal Veterinary College (London University) and a doctorate in animal behavior from the Psychology Department at the University of California in Berkeley, where he spent ten years researching olfactory communication, the development of hierarchical social behavior, and aggression in domestic dogs. I find Dr. Dunbar’s work with puppies specifically to be one of his greatest contributions to the world of dog training. He is an avid and staunch proponent of early puppy training and socialization, a subject that is often glossed over as mere check the box exercise by many dog trainers. And if you like listening to podcasts, check out his podcast, Dr. Dunbar’s iWoofs Podcast. When polled, the Big Dog Mom Facebook Group Community ranked the next three dog trainers as their favorite, so I am including them here as well. Dr. Sofia Yin was a Veterinarian, Animal Behaviorist, Author, and internationally renowned expert on Low Stress Handling™. Her “pet-friendly” techniques for animal handling and behavior modification, many of which she developed herself through the scientific method of research and rigorous testing, are shaping the new standard of care for Veterinarians, Petcare and other Companion and Farm Animal professionals. Dr. Yin passed away in September 2014, but her legacy lives on. Stilwell is the CEO of Victoria Stilwell Positively Dog Training (VSPDT) – the world’s premier global network of positive reinforcement dog trainers. She is a best-selling author (It's Me or the Dog and Train your Dog Positively and others), talk show and media guest expert, and even has her own podcast, Positively Podcast. ** If you would like more information about these dog trainers and their work, download your FREE list of the BEST Force Free Dog Training Books Resource Guide here. This list is a compilation of all of my favorite dog training books, many of which I could not live without! Many methods can be used for shaping a dog’s behavior. Positive reinforcement, positive punishment, negative reinforcement, and negative punishment are the four categories of methods of behavioral training. Important to note, positive in dog training does NOT mean good or helpful, it means to add something. Likewise negative does NOT mean bad, it means to take something away. Just as confusing are the terms reinforcement and punishment, which likely don’t mean what you think they mean. Reinforcement simply means a behavior has been responded to (either by adding something or taking something away) such that it occurs more often. On the contrary, punishment means that a behavior has been acted on such that it occurs less frequently. Look for a dog trainer who understands the difference between these types of training methods. Find one who stays away from aversive methods like choke collars, e-collars, prong or pinch collars, etc. 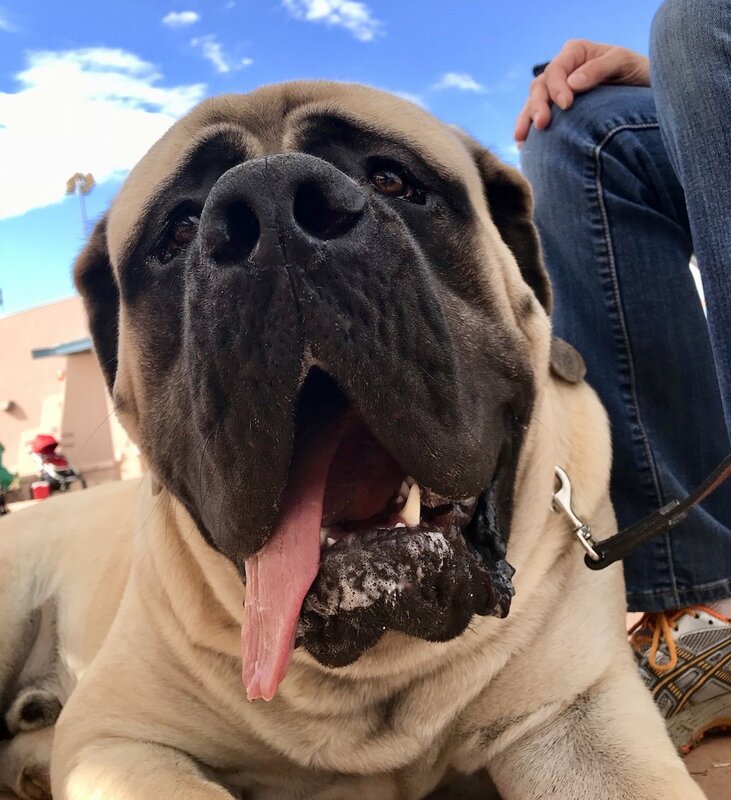 If my 200 pound Mastiff is pulling me down the street when we go for walks, yes, a choke or pinch collar may be effective at preventing him from pulling. But in this case, has the dog learned anything about how to walk on a loose lead by my side? No. As soon as I take that pinch collar off, after one or two walks, the pulling will most likely resume, especially if there is a rabbit or other dog in sight. Put simply, while dogs want to avoid pain, their desire to seek pleasure is much stronger. Play to your dog’s desire; use rewards liberally and consistently, and avoid dog trainers who recommend otherwise. I speak from experience when I say there is nothing worse than going to a training class with a trainer who is biased toward small dogs. Here are just a few comments that I received when in class with 6 month old Junior. Can you hear the antipathy? “Oh, we’ll have to move things around for the big guy. This isn’t set up for dogs his size. Can I get a huge collective eye roll? UGH! Ok, so here’s the point. Find a trainer who has lots of experience with large and giant breed dogs. Preferably a trainer who has a big dog (50+ pounds or more). If the trainer has only ever trained Border collies, they will have a rude awakening when training a Mastiff, a Saint Bernard, or a Newfoundland for the first time. You don’t want YOUR giant to be your dog trainer’s FIRST giant. What do you call the person who graduates last in medical school? The answer is, … a doctor! Look, there’s always going to be someone at the bottom of the graduating class, but at the end of the day, grades mean little when outside the confines of an academic institution. This is as true for doctors, as it is for dog trainers. It is near impossible to distinguish the great from the mediocre just based on title alone. Whether you are looking for a brain surgeon, or a dog trainer, it is your job to check references. Does this dog trainer have a sufficient body of education and experience to do the job? Can you get and speak to people whose dogs have been trained by this person? What awards or accolades has this dog trainer earned since starting their career? Is the knowledge this dog trainer has primarily academic or experiential? Is the track record of dog training success documented? Can you see it? What are your friends and other dog owners saying about this dog trainer on Yelp, Facebook, or other social platforms? You know your dog better than anyone. A dog trainer who presents dog training with a “my way or the highway” or a “one size fits all” approach, is one who doesn’t understand canine behavior. All dogs are unique and should be treated as such. A great dog trainer is a problem solver, an innovative thinker, and someone who approaches each new dog with an open mind. Now, I am not recommending you sign up for an obedience class and complain that the trainer is a nincompoop. You made the choice to enroll in the class. Be respectful. This one may sound odd, but here’s what I mean. As I just stated, all dogs are unique and should be trained accordingly. I believe there is no better way to train a dog than to use treats, toys, and a clicker (when appropriate). I have trained dogs without these tools in classes where they were not advocated or used, and the difference in my dog’s engagement was night and day. Going through the motions of “sit,” “heel,” turn around and walk back, “sit,” “stay,” is not only boring for the dog owner and the dog, it teaches neither the fundamentals of canine behavior nor becoming a canine good citizen. Once free from the prison of this monotonous training structure, these dogs go wild. Think college freshman of helicopter parents on steroids. Watch out! The best dog training classes mimic the “real world” in order to foster true canine good citizens. Here are a few tips on how you can immediately put this information to action and land your big dog the best dog trainer around. Here are 9 websites for force-free trainers and other fantastic dog training resources! Make a list of 2-5 dog trainers that you are considering and go observe a class. Speak directly to the trainers if you can. Ask the questions posed in point #3 above. Ask for references of other students that have trained under this instructor. Put simply, do your due diligence before committing. The more you know, the better able you will be to decipher a great dog trainer from the last-in-class graduates. To help you with this, I’ve compiled my exclusive list of the BEST dog training books, some of which I absolutely could not live without! Grab your copy here. If, after following tips 1-3, you have not found a great force-free dog trainer in your area, consider taking your training online. There are a plethora of online schools who offer dog training classes from puppy training on up to advanced agility, nosework, and rally obedience. Previous Post: « Trimming Dog Nails Like a Pro: Dog Nail Clipper or Dremel for Dog Nails?